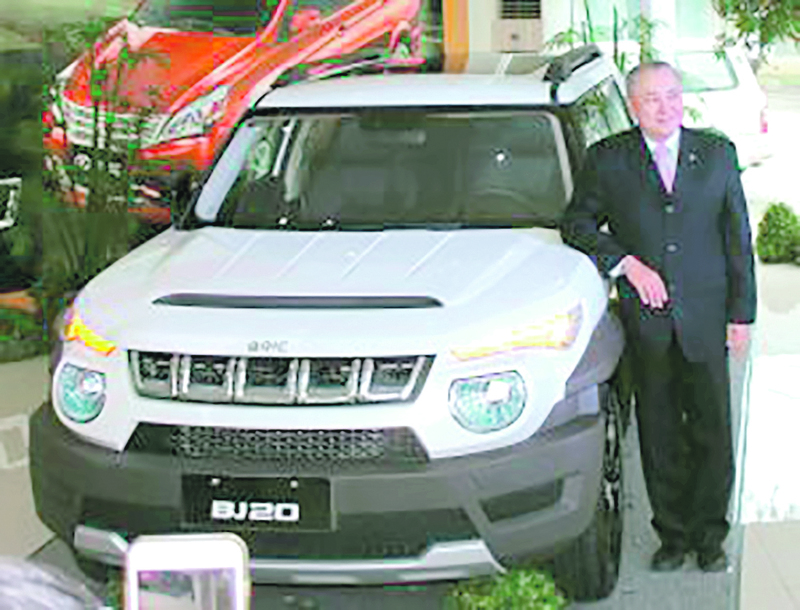 After having successfully marketed their product line of family-oriented 3-row 7-seat multi-purpose vehicles, Bayan Automotive Industries Corporation (Bayan Auto), the Philippine distributor of BAIC Automotive Group Co., Ltd., introduced their first crossover sport utility vehicle the 2019 BJ20 on September 28, 2018. George Chua drove the BJ20 around the Baguio Country Club. A few days later, on the 8th of October, Bayan Auto invited a select group of motoring journalists to test drive the BJ20 from Manila to Baguio City and back. We took the higher-spec BJ20 Luxury from the traffic gridlock of Metro Manila to a high-speed drive over the Tarlac-Pangasinan-La Union Expressway (TPLEX) and on a roller coaster ride up and down the mountain roads leading to the Summer Capital of the Philippines. Needless to say, we came away impressed with the Snow White BJ20 Luxury. BAIC Philippines President George Chua poses with the BJ20, Bayan Auto’s piece de resistance. On the 24th of November, we were privileged to drive an Aurora Green 2019 BAIC BJ20 Standard from Metro Manila to Clark, Pampanga for the 8th edition of the JSK Auto Fun Run. We revved up the turbocharged 1.5-liter 4-cylinder engine and had tremendous fun on the North Luzon Expressway (NLEX). The double overhead camshaft (DOHC)-equipped 16-valve MIVEC-enhanced inline-4 engine churns out 147 horsepower at 6,000 rpm and 210 Newton-meters of torque between 2,000 to 4,500 rpm, which was more than enough to keep pace with the sports cars and modified hot rods that joined the JSK convoy. Out of respect for the NLEX patrol officers, we reined in those horses, which can propel the 1,460-kilogram BJ20 to 170 km/h top speed, and settled for the legal 100 km/h speed limit. All throughout the drive, the Constantly Variable Transmission (CVT) shifted gears automatically and seamlessly. Our civilized manner of driving on the highway returned an average fuel consumption of 7.5 liters per 100 kilometers, which is equivalent to 13.33 kilometer per liter, while the stop-and-go traffic in the metropolis increased the consumption to 12 liters/km, which is about 8.33 km/liter. Despite the reduced fuel mileage, we were happy to note that the BJ20 complies with Euro 5 standards to help protect the environment while it’s sitting in traffic. Squint your eyes and the BJ20 looks like a smaller version of a Hummer or an FJ Cruiser. The front is adorned with a 5-section grill and two high-intensity discharge (HID) Xenon headlamps topped with eyebrow-like daylight running lights (DRL). Its front facade impacts a rugged, almost robotic yet lovable appearance that it is almost certain the BJ20 will have a cameo role in the next Transformers movie. The side view of the BJ20 imparts a chunky tough look with a high beltline, contoured slab-sided doors, over-fenders that are color-keyed with the bumpers, and thick A-, B- and C-pillars. The 2,670-millimeter wheelbase separates the front and rear 18-inch 10-spoke wheels shod with 225/55-18 Cooper CS4 Touring tires. The 4,451millimeter-long BJ20 features a 215mm ground clearance, a 24-degree approach angle, a 30-degree departure angle, and a 20-degree ramp break-over angle. Although, the available units are front-drive (FWD) only, we’d like to see a 4WD version in the future.